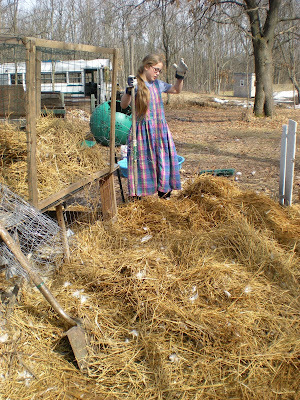 Choring is the word our farmer friends here in Amish country use to describe the doing of their varied daily agricultural tasks. Our city-slicker children initially thought this was a funny way of putting it, but our limited exposure has revealed other related terms such as: lunching, concreting, and combining (with the emphasis on the first syllable -- the thing a combine does). Ben refers to this handy manipulation of words as verbing. 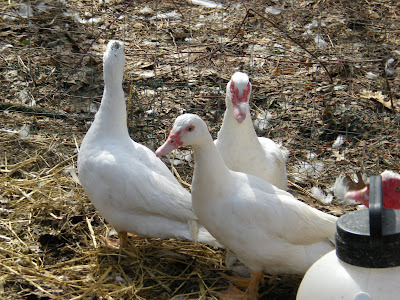 On our farm, our daily agricultural tasks only involve certain quackless fowl. Choring is divided up between between Rebekah and Joanna, with Susanna and Noah waiting in the wings, pardon the pun (if that passes for one). They braved the brunt of winter, the relentless wind, the really cold ice and the arctic blast to deliver food and momentarily liquid water (that was a dilemna) to our remaining six head of muscovy ducks. Though it was another very cold Wisconsin winter, each fowl fared fine, and we lost none due to hypothermia. Rebekah and Joanna were troopers in keeping the ducks in high protein crumble and gave us daily updates on the ducks' antics. "They don't want to leave their house." "They like to eat snow." Now that spring is here and the snow has finally melted, changing out their straw is much easier. It is a pretty quick process in which many hands make light, but stinky, work. Joanna and Rebekah shovel out the straw, and it is quickly transferred to the waiting vehicle of the little brothers. 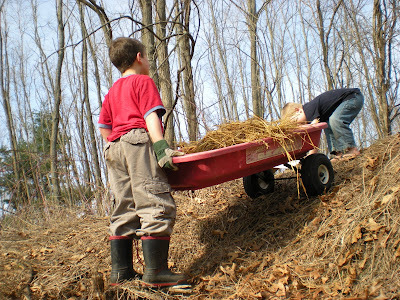 The boys push their vehicle up a hill into which our compost bin is built, so they can dump-truck the old straw into the bin from above. 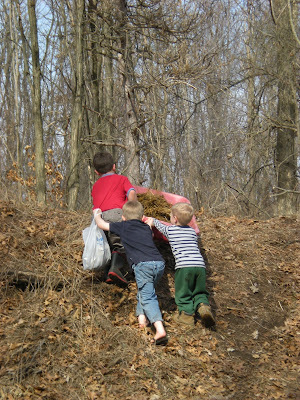 This was their decision, as the girls don't really care where the old straw goes, and the boys just want a good reason to climb the hill. 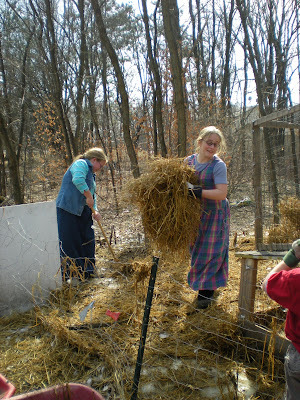 The relatively fresh straw is tossed into the duck house. The ducks appear to patiently wait for us to finish with whatever it is we are doing. Can you see the looks of thankfulness on their bills? Me neither.